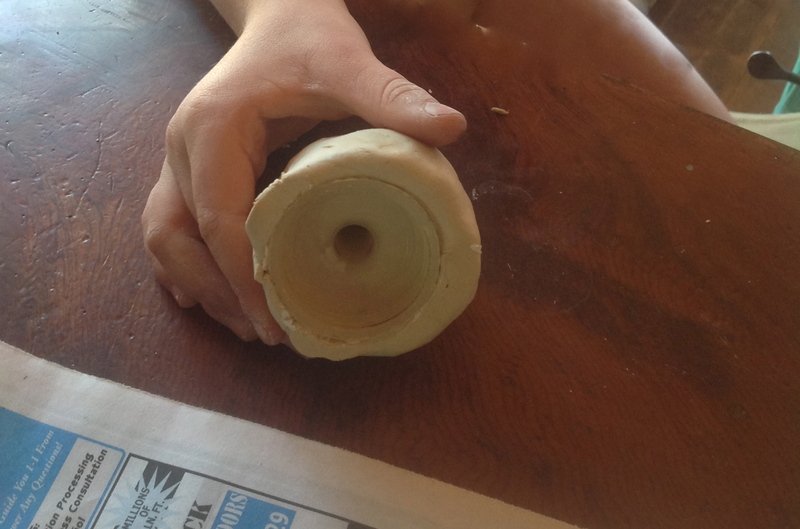 Budding Egyptologists: Make Your Own Canopic Jar! Greetings! This is a straight-up wonderful project for kids and adults alike. 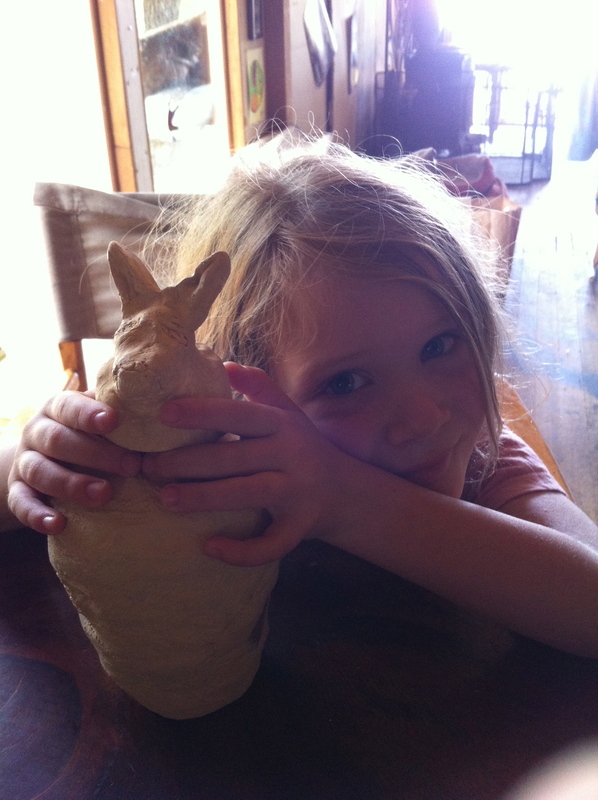 Captain made her very own canopic jar as part of an extensive study of ancient Egypt, and it has turned out to be a wonderful art piece, not to mention a terrific keepsake of this lovely period in her life. I HIGHLY RECOMMEND THIS ONE! These jars are made from a condiment squeeze bottle (like ketchup! ), wadded-up paper towels, masking tape, pre-plastered gauze rolls (I used the leftovers from a belly-cast I did while I was pregnant), Crayola air-dry clay, and paint. Kids could also create an entirely different style of jar using this method, without an Egyptian theme, if desired, and the possibilities are creatively endless! In the time of Ancient Egypt, canopic jars were used to store particular organs of the body during the mummification process, and were placed in the tomb along with the sarcophagus containing the prepared body. The jars had lids, or stoppers, that were shaped as the heads of the minor funerary deities known as the Four Sons of Horus. It was the job of these deities to protect the internal organs of the dead. Ancient Egyptians firmly believed that the deceased required his or her organs to be reborn in the Afterlife. The organs needed to be removed from the body so that it would not decay, but needed to be present with the body, so the jars were used for their storage. They were made of natural materials such as limestone, wood, pottery, alabaster or calcite. There were 4 jars used. The deity Hapy, the baboon, was for the lungs, the human-headed Imsety guarded the liver, Jackal-headed Duamutef held the stomach and the falcon-headed Qubehseneuf took care of the intestines. Fascinating! Captain chose Duamutef for her jar and created a wonderful jackal-head out of simple air-dry clay right onto the squeeze bottle top! 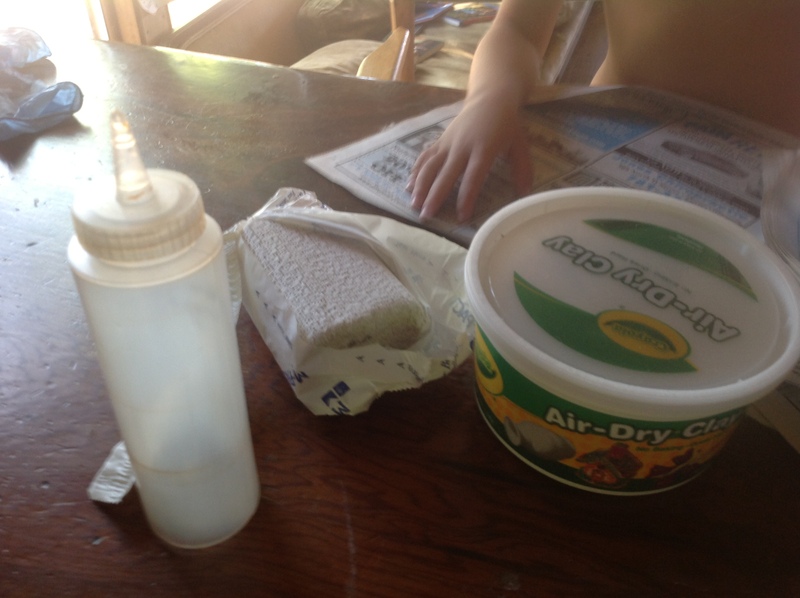 One plastic squeeze jar or bottle with a top (preferably a pointed top as shown above, because it provides an armature for holding the clay head tightly in place and makes it much sturdier), pre-plastered gauze rolls, self-hardening modeling material, like Crayola’s brand, masking tape, paper towels or newspaper, acrylic or tempera paint, paint brushes. Step One is simple and fun. 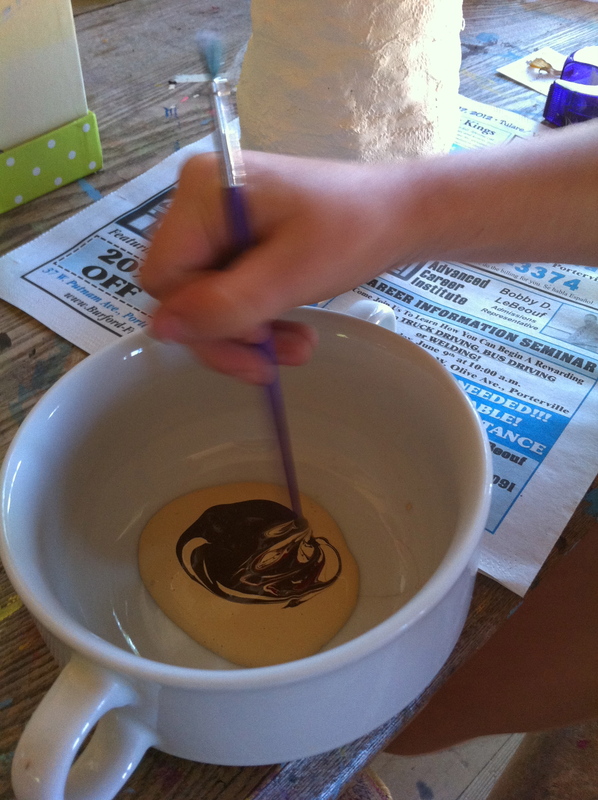 Use wadded up paper towels and masking tape to create a canopic jar “shape”. I pulled a bunch of strips of tape off and had them ready for her and helped her to hold the paper towel wads onto the jar as she taped. She stopped when she got to the shape she desired. 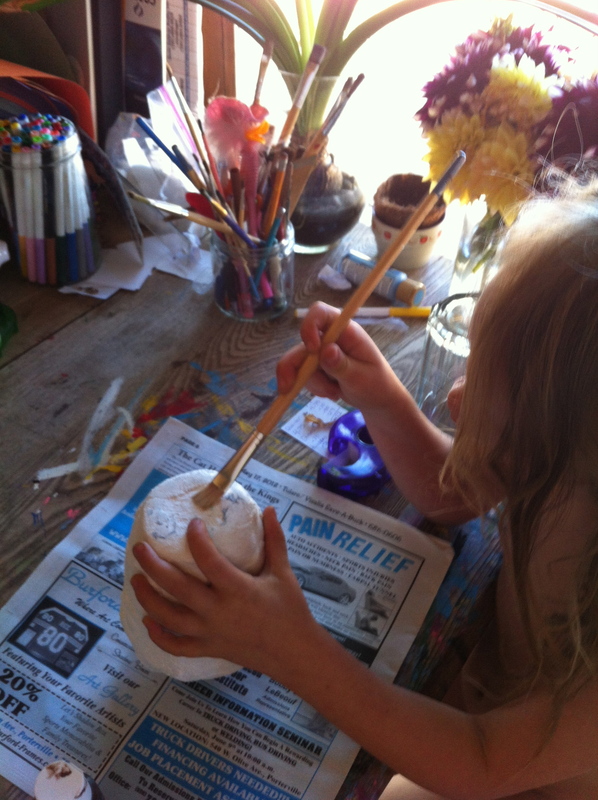 Leave the top of the squeeze bottle in place while creating the body of the jar, including applying the plaster strips. 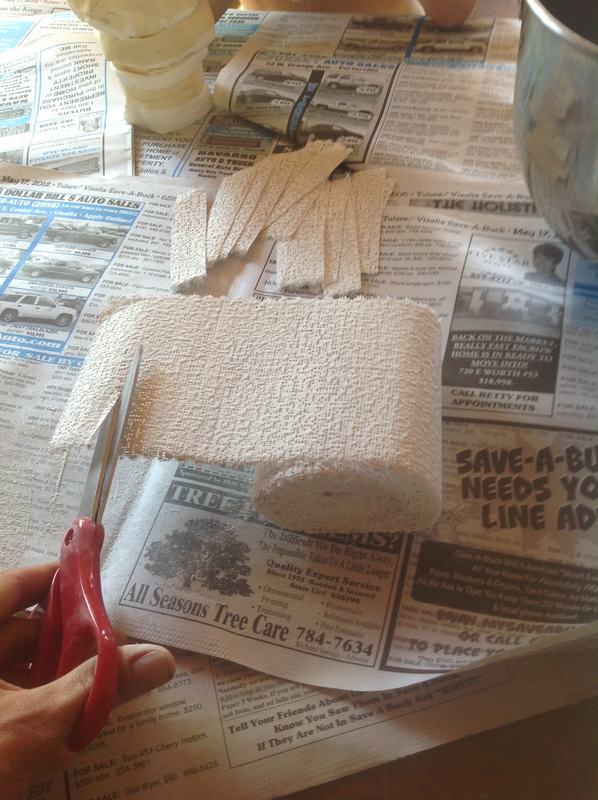 Step Two: I pre-cut the plaster gauze rolls into strips and had a bowl of water on hand. Dip each strip quickly into the water and apply to the jar to cover completely in overlapping layers. Cover the bottom first and work up from there, covering the entire jar and smoothing it all down as you go. Do NOT cover the jar tops, as the heads will be formed later with clay, after the body of the jar has dried. 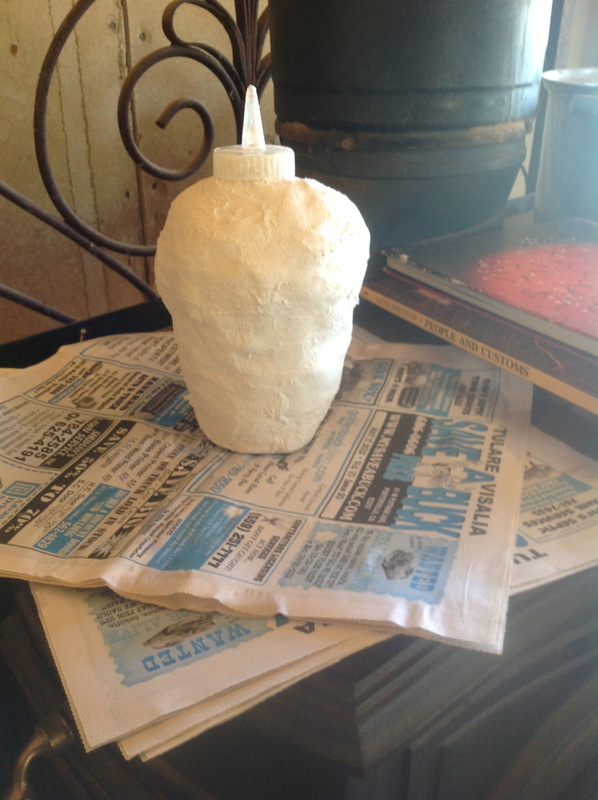 While the jar then dries for a day or so before painting, the top can be removed to start working on creating the head! Step Three: If it has not already been decided, the child should choose which of the 4 deities they would like to make. Captain chose Duamutef, the jackal-headed god, and there were lots of gooey comments about the stomach that would have gone into this one 🙂 I basically gave her a smooth ball of air-dry clay, she flattened the bottom, and I helped her press the lid into it. Again, the pointed tip provides an excellent armature for making a solid head. 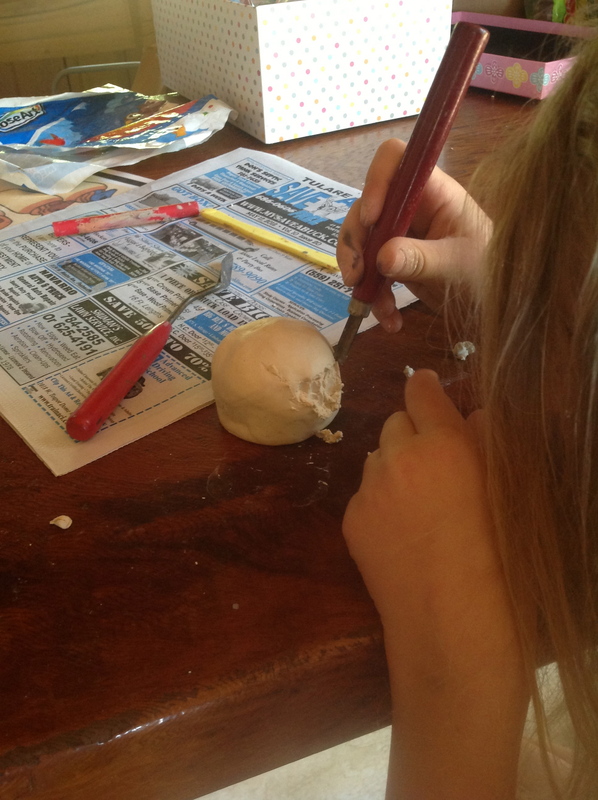 Using clay tools, or anything you have on hand like toothpicks, knives etc., help guide your child in carving out the basic shape of the desired head. 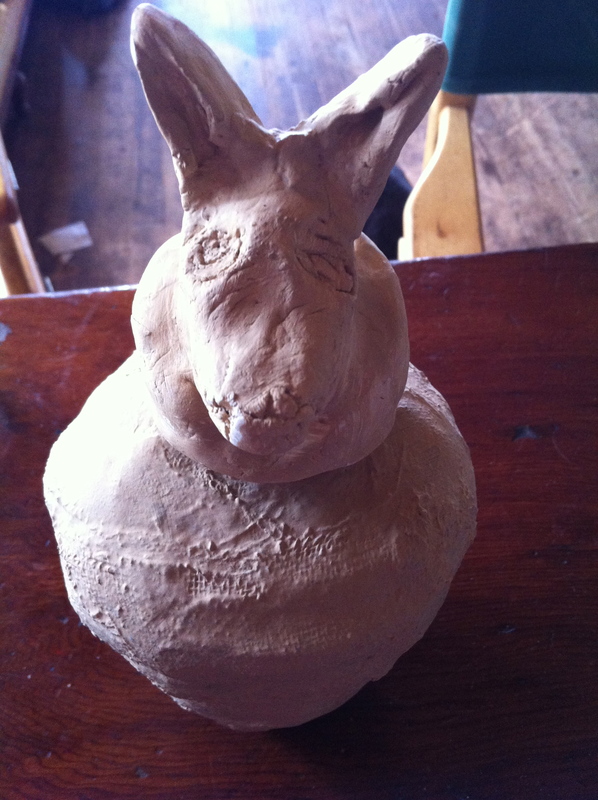 I explained that she would need to remove clay from under the “chin” and extend the nose to get the jackal face that she wanted, and she did an awesome job shaping the clay. I helped a little bit here and there. I showed her how to add the ears before adding the final details to the face. I got out some toothpicks and after she shaped the ears, I showed her how to use a toothpick to secure the ears to the head and then use her fingers to carefully sooth the clay down to help secure the ears in place. The jackal is the only one that has ear “extensions” like this, and we really wanted to make them sturdy! 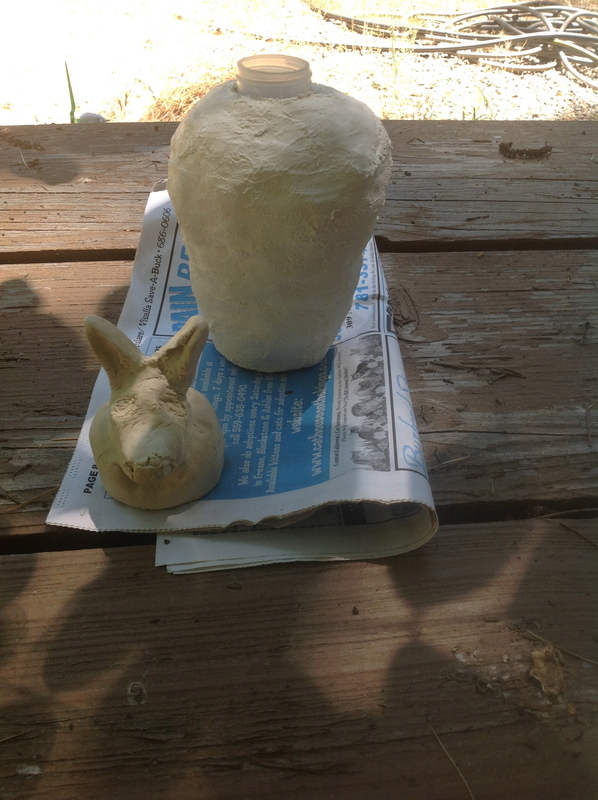 The air-dry clay was very thick and took a few days to dry outside. Meanwhile, the body of the jar had dried and was ready to paint! If the jar and lid are both going to be one solid color, you can wait to paint them both at the same time, but there are endless ways to paint and decorate the jar. Captain went for a solid-color “stone” look after painting the bottom of the jar a dark color and then changing her mind. 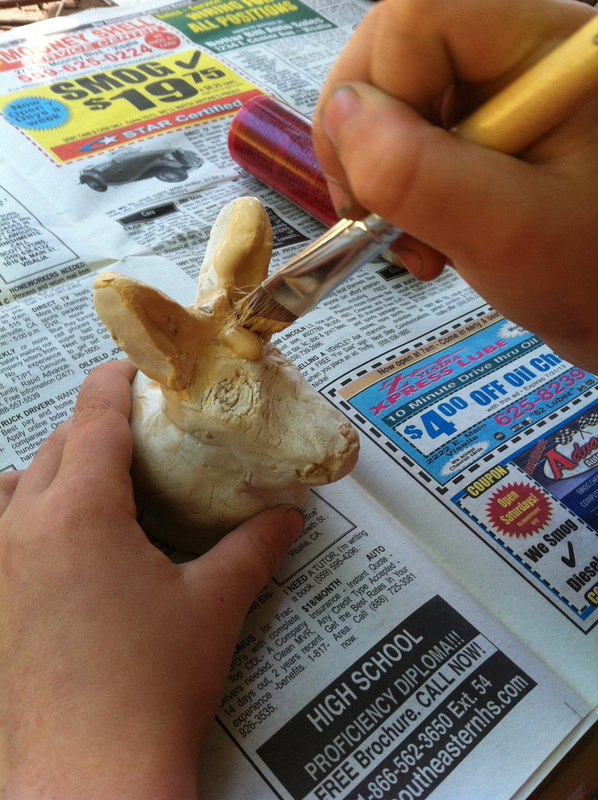 Painting the jackal head…. It looks so cool!! Painting the jar was fun. 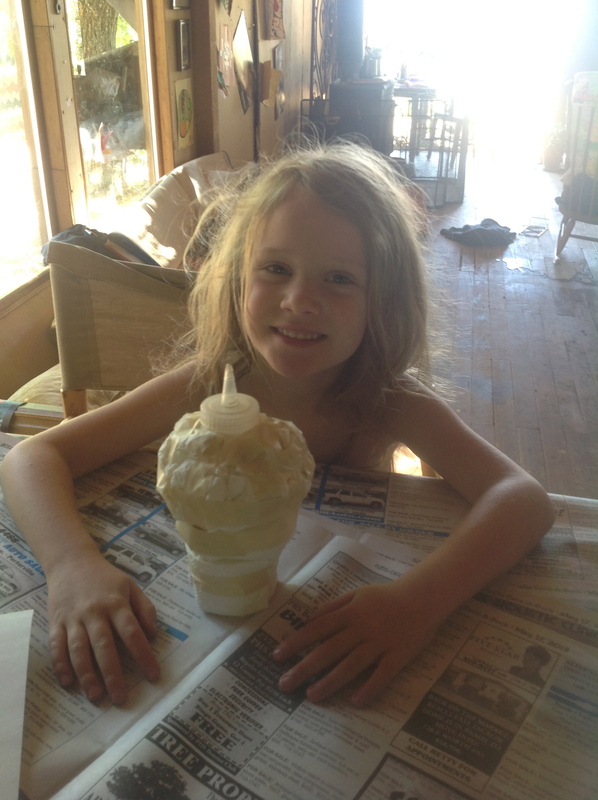 When she got bored with painting it the second time, Dad jumped in and helped too! Read more about Canopic jars of Ancient Egypt here and definitely google “canopic jar images” to see some fantastic examples of both ancient canopic jars, and handsome ones made by students and Egyptologists alike! Visit Discovery Kids to try your hand at preparing a body for mummification online, courtesy of BBC. 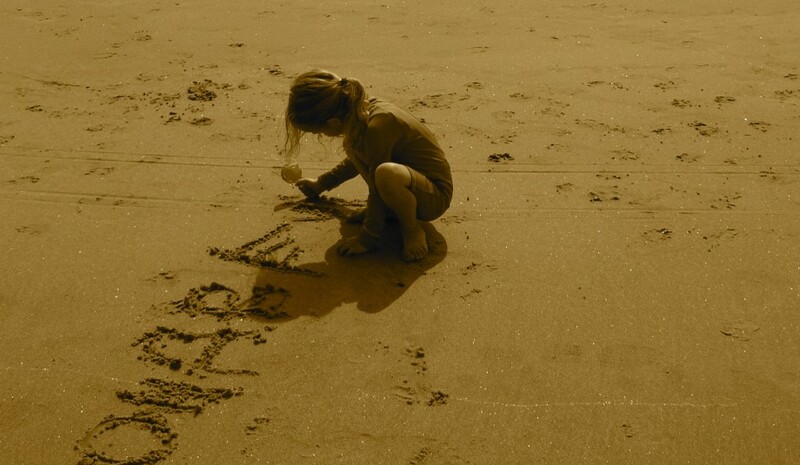 Thanks so much for reading, and if you try this project with your kids, we would love to hear about it!